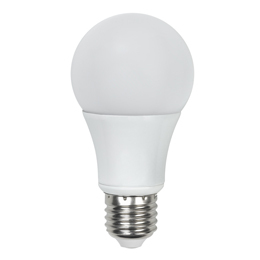 Whether you're seeking a warm white glow of the A19 LED 2700K for a sophisticated, intimate feel in your dining room or the clarity and precision that the A19 LED 5000K daylight white bulb brings to your office or workshop, the LED A19 100W replacement bulb offers a versatile, long-lasting solution that's ideal for use in enclosed fixtures. Superior Lighting stocks LED A19 retrofit light bulbs. Visit us for LED A19 60W lamps at wholesale pricing. These LEDS replace your standard screw in light bulbs. We have an 8W LED bulb that replaces a 40W and a 12W LED bulb that replaces a 60W. These LED bulbs are available in 2700k and 4100K color temperatures.